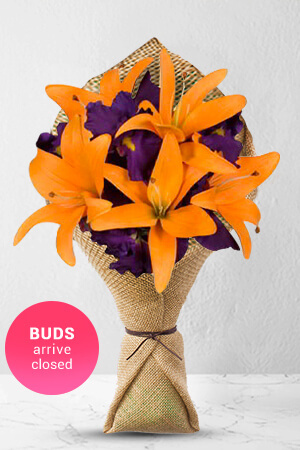 This delightful bouquet combines a sunny mix of bright orange Asiatic Lilies and Lush purple Iris flowers and makes an ideal gift to put a happy smile on any face.Lilies may be sent closed/partially closed in order to prevent damage and to last longer.Vase not included however to better personalise your gift, we recommend adding a Standard Vase to accompany this lovely combination. Flowers were delivered same day and quality was excellent. Fast snd professional! Highly recommended. Ordering from the UK was great. I have used Zflowers before and they have always been on time and the flowers are of excellent quality.Keep up the good work. I got notified that flowers had arrived at destination.